Hobnail has recently completed their 6th studio album, "String Things". The album features songs from their entire career - some old favourites that deserved to be re-recorded, some new songs, and some cover versions that they have made their own but have never recorded. This is the album that many fans have been asking them to make for years. Hobnail (then Hobnail Boots) started life in 1994. Initially a trio, they soon expanded to a 5 piece, and have expanded and contracted regularly over the years. Rob Joass (vocals and guitar) and Jo Moir (vocals and violin) have been the mainstays from the beginning, with multi instrumentalist Hamish Graham joining not long after. Caroline Easther (drums and backing vocals) has been with the band for so long that nobody can remember exactly when she joined. Guests on this album include previous collaborators Wayne Mason (piano) and Alan Norman (accordian) as well as new friends Kim Bonnington (vocals) and Dusty Burnell (mandolin). Hobnail performs regularly all over New Zealand. They have appeared on Friday Live on National Radio several times, and have previously been finalists for Best Folk Abum and Best Country Song at the New Zealand Music Awards. It will be great to get back to this part of the country and celebrate with friends and fans - albums will be fresh off the press and available for sale. 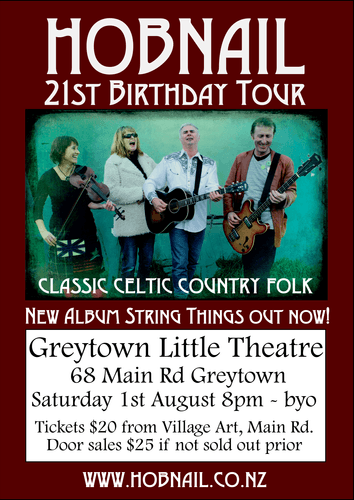 Tickets available in advance from Village Art, Main Rd., Greytown. Door sales $25 if not sold out prior.